Alice Guy finally moves into the twentieth century with a narrative short with editing and identifiable characters. It’s sort of a sequel to “The Cabbage Fairy,” or maybe it’s a satire. 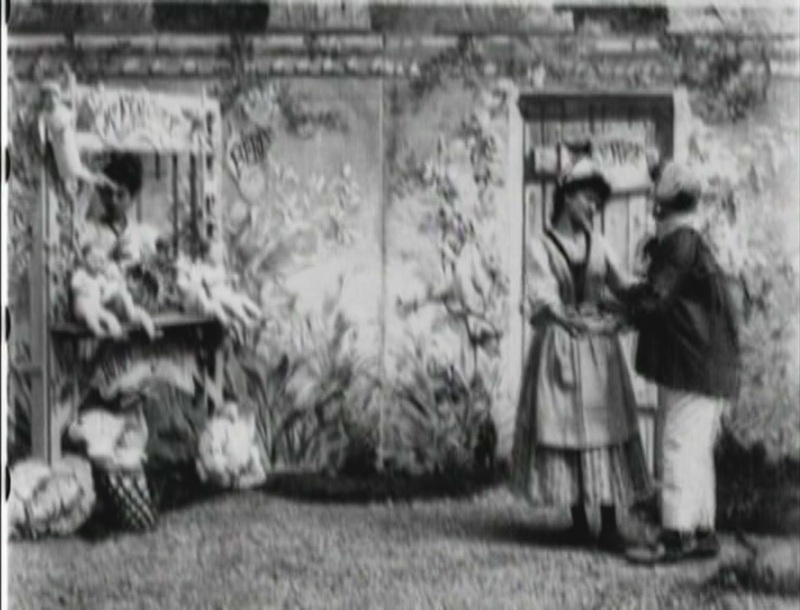 The movie opens on a small stage which is dressed in vines and flora, with a door in the back. One woman stands behind what looks like a flower stand, and a couple (man and woman) approach from stage right. All of them are in what seems to be antiquated clothing, making me think of a fairy tale. The couple discuss their finances, and the man takes out a purse and shows the woman how many coins he has. She looks happy, and approaches the saleslady. The lady at the stall now produces a series of baby dolls, each of which is examined by the customers carefully and discarded. Finally, she leads the pair to the door in the back of the stage. Then there is an edit! And we find ourselves in the space behind the door, which seems to be a large cabbage patch. She now leads them between the rows, and starts pulling out live babies for them to consider. As they discard each one, she places them on a blanket near the front of the screen. Soon, there are five or six screaming babies. Occasionally, she shows them another baby doll (including one with black skin), but these are quickly discarded as the lady customer clearly wants a live child. Finally, she finds one that is to her liking and the man pays the baby-dealer. I was so surprised to see an edit in an Alice Guy film that I almost fell off the couch. Remember, by 1902, Georges Méliès was putting out “A Trip to the Moon” and Edwin S. Porter made “Jack and the Beanstalk,” both movies that relied on multiple edits to tell complex stories. But Guy seemed to stay in that early “Age of Attractions” mode that just involved pointing a camera at a one- or two-minute subject and letting it run right into the twentieth century. Finally, she took a chance and expanded her storytelling technique, and it’s interesting to see where she goes with it. The movie appears to be intended as a mild comment on the fickleness and arrogance of the rich, although with its fantasy setting it can’t be seen as a serious social critique. In “the Cabbage Fairy,” we get the sense that the fairy is bringing welcome new life to the world as a gift, as the spring sun makes the flowers bloom without expecting recompense. In this film, she has been transformed into a merchant, trying to please snobbish clients. I see this as satire, but I’m not certain how far I can run with that. Although the title suggests that only the wealthy are the subjects, I wonder if it isn’t a comment on commercialism more generally, and its dehumanizing effects.